With the construction activity in my basement drawing to a close I finally had a chance to fire up the layout again. 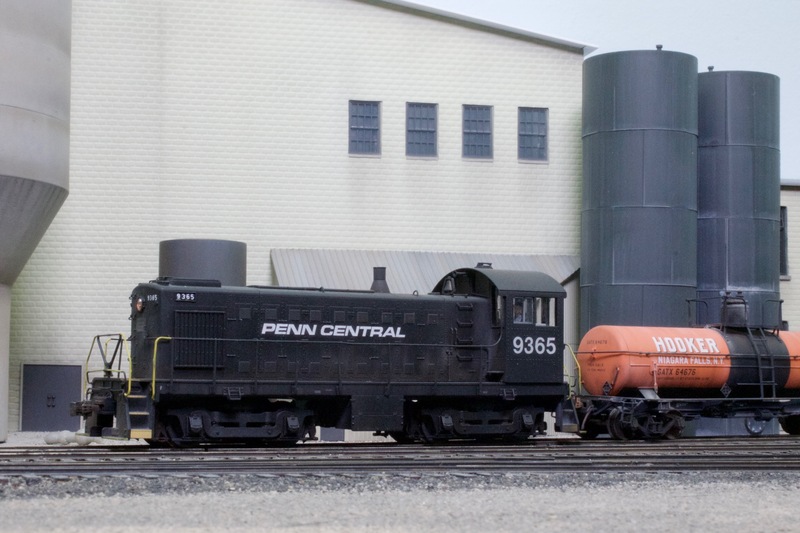 Here are a couple of shots of Penn Central 9365 shoving back to spot some boxcars at the International Paper warehouse. Hunter You Have faithfully reproduced the Era I remember in my youth growing up in the Town of Wheatfield (North Tonawanda N.Y.) I remember all these Industries as a youngster seeing them dump the slag at night from Tonawanda Iron was a sight to see.and crossing the Tonawanda Island Bridge to the International paper Mill. and watching the Trains along River Road and all the other sights in the area. Great work my Friend. I guess that’s about the best testimonial I could ask for. Thanks so much! GOOD SCENE! I LOVE SEEING AN ALCO SWITCHER HARD AT WORK!